Orthodox Christianity is not a spectator sport, neither is it like going to the theatre where one sits in the auditorium awaiting to be entertained. The Church is the community of faithful Christians who walk together on their journey of salvation towards the Risen Lord Jesus Christ. As St Paul states, some people are asked to complete specific roles within the Church, but this is not seen as any sort of ‘hierarchy-of-grace’. Everyone is important. Everyone is called to pray the Divine Liturgy. Everyone works out their salvation equally within the Church. It is the job of the laity to guard the Faith and protect the Church from falling into error. 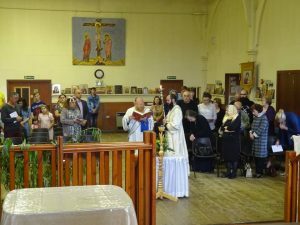 From amongst the congregation, some people are chosen to read, to sing, to teach, to make beautiful the gardens, to repair the buildings, to serve the Divine Liturgy, to make food, to preach, to organise pilgrimages, and so on. Some of these jobs are ‘more public’ than others, but all are equal in importance. A couple of the more visible jobs within the parish include the clergy, the choir, and the wardens.